Have your heard the great news? Eating Fat doesn’t make you fat (cue the choir singing “Hallelujah”). To ripen an avocado, you can place in a paper bag with an apple or a banana to speed up the process. I keep my avocados on my counter to ripen. Once they reach the desired ripeness, I move them into the fridge. To keep your cut avocado from turning brown, keep the flesh with the seed. The seed will help prevent the flesh from oxidizing. Avocados aren’t only good to eat, you can use them as a moisturizing natural facial mask. Because Avocados are such a wonderful food to eat, why not eat them for dessert? Avocados can be part of a low carb and sugar free diet. Here are some recipes that may help you get started eating some delicious avocados. Have you ever thought about Avocados in a dessert? What are your favorite ways to eat avocados? Click here for my favorite sugar free sweetener. Sweet round-up! 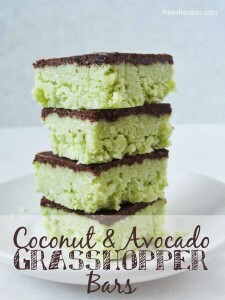 Thanks for sharing my grasshopper bars. 🙂 Avocado was one of my youngest’s first foods too. I’d never eaten them before introducing them to her – now I’m hooked! Before Aidalyn, I only ate it with Mexican dishes for guacamole. Now, I know that you can use it for so so many more things. 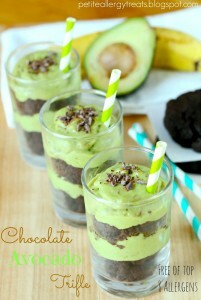 I used to make an avocado chocolate pudding almost every week. Thank you, Laura! I wanted to help spread the word that Avocados are Awesome, haha. Your recipes are so great for familis and kids too. I know Sharon! 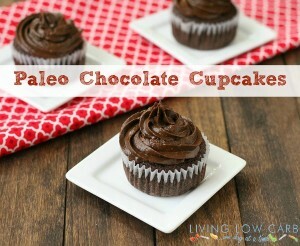 These look so delicious too. I used to make a chocolate pudding with avocado, but that was about as close to an avocado dessert that I would get. I know you can easily add avocados to baking recipes in place of other fats (but I usually just use butter or coconut oil). Thanks for leaving me a message! Great roundup! I love avocados and try to include them in my diet almost every day – such a good, healthy fat! Great green ideas for St. Patrick’s Day! I’ll plan to share your roundup with my audience. This post is fascinating, Angela! 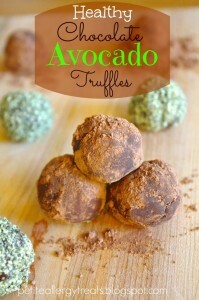 I love avocados… but I’ve never thought to use them in a dessert! What fun… and what delicious results it can produce! I know what you mean, Erin. And I didn’t know that Avocados were actually a fruit… but it makes sense. I think anything with a seed in the middle of it is a fruit? Something like that for classification. I do love how creamy avocados are. That is a great texture to have in desserts. Thanks so much for reading! Wow a great list of delicious desert and so tempting. Love your list of health benefits of avocados. Thanks for sharing on Real Food Fridays Blog Hop. Always love your post. Have a wonderful healthy day! LOVE LOVE avocados!!! I never knew that keeping the seed part will help it from getting brown – will try that next time. Of course my favorite is guacamole with chips but I also like it just sliced with lemon juice. 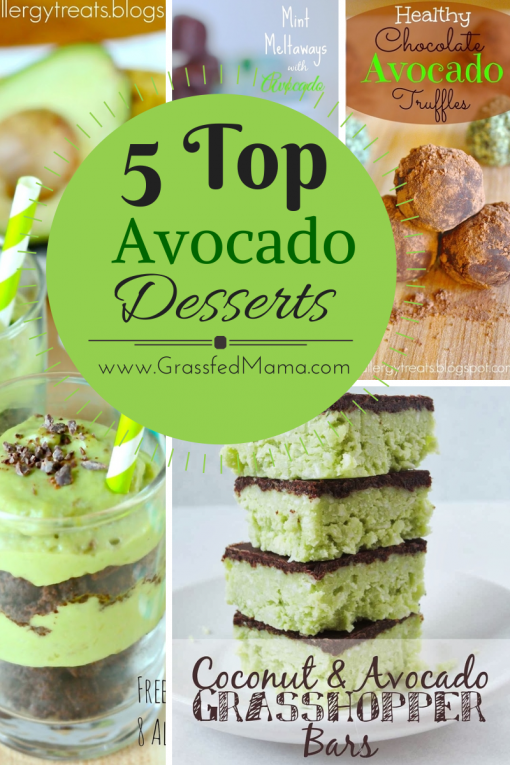 I’ve never tried avocado desserts, but I will now!!! 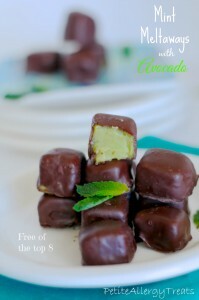 The coconut and avocado bars look heavenly!! Thanks for sharing at Wake Up Wednesday!! Thank you so much for stopping by! I love avocados too… I love that I can eat them as a dessert now. Avocado is one of my favourite fruit. You have given me some great alternative to process the food. They look so yummy. I think it is a must try list of recipe. Thank you for sharing in Pintastic Pinteresting Party. I love how fun the green color is for kids too. You can make it seem like your are using green food coloring, when it is just a natural green.